Clair T. Rollings was the Educational Adviser for Civilian Conservation Corps company 708, first at Lake Winnibigoshish near Bena, Minnesota and, later, at Camp Rabideau, near Blackduck from 1933 to 1939. After 5-1/2 years with Camp 708, Mr. Rollings was transferred to Camp 712 at Grand Marais for a few months before enrolling in the graduate program in Wildlife Management at the University of Minnesota. In his memoir, "History of Company 708 Civilian Conservation Corps," Mr. Rollings remembered what camp was like for enrollees and staff. The arrival of new rookies in camp was always a memorable occasion. The new recruits attended special lectures by the Commanding Officer, camp Doctor, camp Superintendent and Educational Adviser, each explaining a particular phase of camp life. Then came the shots in the camp hospital. Practical joker hospital orderlies always had a huge dummy syringe which held a full pint of dangerous looking liquid. It had a blunt and bloody needle the size of a lead pencil. This ominous looking instrument was jerked out of a drawer as the orderly grabbed the bare arm of an innocent looking rookie and prepared to ram the huge needle to the hilt. The rookie usually turned pale, fainted or took off for the barracks. During their first night in camp some rookies were always sent out in the woods with a sack and a lantern on a snipe hunt. Others were sent to the supply room for striped paint, left handed monkey wrenches or elbow grease. For the Enrollee who habitually overslept and rushed out of the barracks putting on his clothes at the sound of the breakfast whistle, a special trick was reserved. His work shoes were nailed to the floor when he was not watching. The next morning he jammed his feet into his shoes and took off for breakfast - but his shoes stayed beside the bed. This trick was particularly effective when the tricksters not only nailed the shoes to the floor but crawled under the barracks and clinched the nails. Camp newspapers played an important part in camp life. In addition to the national CCC newspaper, Happy Days, each camp produced its own paper. Articles covered everything from camp policies and education, to gossip columns, jokes and cartoons. 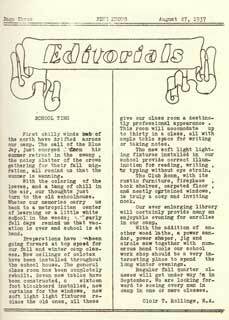 Mr. Rollings, as educational advisor, often wrote articles for the camp newspaper, Pine Knots. He remembered that members of his camp took pride in their monthly publication. Always displayed in our library were several copies of Happy Days, a commercial print newspaper covering CCC activities throughout the nation. All camps received this newspaper. In addition, Co. 708 put out its own Pine Knots. This was a monthly, mimeographed publication. 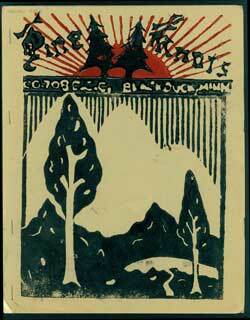 Pine Knots was the only camp paper in the country with a block printed cover, in full color. The center section of the cover was changed with each issue to fit the season. It was a lot of work but the pride and satisfaction gained in getting out Pine Knots was well worth the effort. 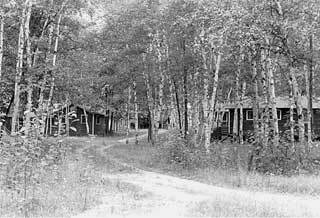 Rabideau CCC camp, Chippewa National Forest, Beltrami County, 1974. 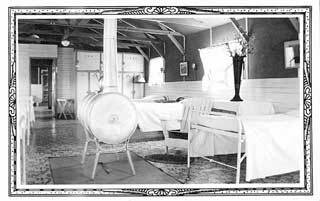 CCC camp infirmary, Nevis, 1936. Cover of Pine Knots, camp newspaper for CCC Co. 708, January 1937. Editorial from Pine Knots, CCC Co. 708, Camp Rabideau, August 27, 1937. 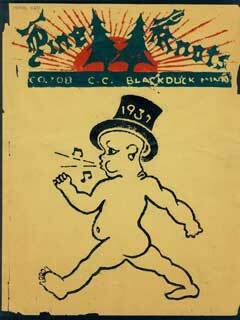 Artwork: Cover of Pine Knots, camp newspaper for CCC Co. 708, August 1937. Rollings, Clair T., author; Stanley Johnson, Collector. Papers Regarding Civilian Conservation Corps camps in the Chippewa National Forest, 1933-1977. MHS Manuscripts Collection.